The benefits of quitting smoking are endless. Not only will throwing out your cigarettes save you money, but you will also save yourself from unnecessary illness. 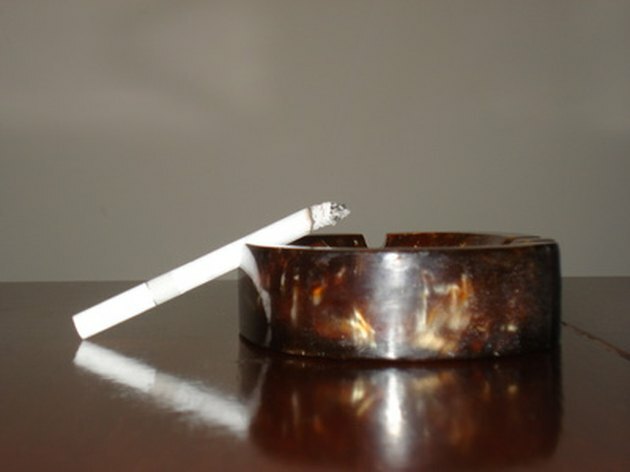 One obstacle many ex-smokers don't anticipate is removing nicotine and tar buildup from the walls and ceilings in their home. But if you don't want your home smelling like an ashtray, there are ways to get rid of those nasty stains and odors. Years of smoking in your home can leave unsightly and smelly nicotine stains on the walls. Fill one bucket with 1 gallon of hot water and set it aside. You will use this water for rinsing. Put on your waterproof gloves. Fill the second bucket with 1 gallon of hot water. Add 1/2 cup Borax, 1/2 teaspoon dish detergent and 1 tablespoon ammonia. Mix well. Wet your mop in the cleaning solution bucket, and squeeze out any excess. Start at the top of the wall and mop your way down. Rinse your mop often, and change the rinse water as soon as it appears dirty, which will be often. Inspect the walls after you have gone over them once. If they appear to still have nicotine, soot or tar residue, go over them again.